The Spiritual Successor to Night March of Kalkamedes. If you want proof that the (in world) Pathfinder Society has become a more Good organization much softer and more beneficial than the old this scenario is exhibit A. This scenario casts the party as something halfway between a Trauma Therapist and an HR Specialist, setting aside at least momentarily the looting and killing to help one of thr Society's own, a troubled cursed Field Agent who was traumatized on the job. The entire adventure takes on a dark and despairing tone with the party serving as the light. It also takes on a delicious tone of African folklore which is a subject that paizo traditionally fumbles but handled quite well here. If I have to quibble its this - the Scenario places a premium on surviving the Serengeti but environmental effects are trivially overcome by experienced parties and potentially supremely deadly to inexperienced parties which doesn't sit quite right with me. The fights are quite hard to begin with - a party hobbled by fatigue and exhaustion would be in a world of hurt which makes this a sort of poor scenario for larger conventions. I was a player in this at low tier, and afterwards read it for this review. Bones of Biting Ants has a lot that on the surface makes it seem like it'll be reminiscent of a Season 0 or 1 type of scenario, but it actually has a much deeper spine. It involves a player-facing sub-system that was a bit jarring at first but I can now see and appreciate (in retrospect) what it was trying to accomplish. It's not a perfect adventure, but there's enough interesting and original features in it to make it one worth seeking out. This scenario is one in which what the players take away as their goals from the initial mission briefing could be something different than what the author assumes, and that can lead to some major problems. The Venture-Captain's final words to the players are "Find the treasures, compel the nuno to lift the curse, but most of all, help Stuinvolk find peace." The mistake I made as a player was in thinking that the first two things (recover artifacts, lift curse) were the "real" goals of the mission, and the "help Stuinvolk find peace" bit would be accomplished through getting the curse lifted. However, it turns out that the opposite is true. The scenario assumes the PCs make multiple attempts each day of the expedition to gain insight into what Stuinvolk is going through and to try to connect with him on a deeper level. This is represented by a fairly elaborate mechanical sub-system drawing on the Influence rules from Ultimate Intrigue. The PCs need to accumulate "empathy points", and the number of successes they get determine Stuinvolk's mood, how easy or hard it is to influence him further, how much he helps the party (in quite specific ways) in later encounters, etc. It's a situation that's original and compelling, and I can definitely see how it enables quality role-playing at the table. However, I think the concept came across as forced and intrusive to me for a few reasons. First, as I mentioned earlier, I originally took something very different away from the mission briefing. Second, Stuinvolk has been dealing with this for a decade and is stated to have had a counsellor during this time, so it felt a bit far-fetched and also presumptive to try to get him to have some sort of cathartic release with us strangers. Third, my PC just wasn't the type for deep soul-searching talks and so (on his behalf) I felt resentful of the mechanism. But I'm sure my experience won't be universal, so I'll chalk it up as a good idea that maybe isn't implemented quite as seamlessly as it could have been. The first real encounter on the journey is portrayed well. The Pathfinders run into a Mzali patrol and either have to persuade the leader to give permission for a trespass into the tribe's territory, or fight their way past. A little detail I *really* liked is that the patrol leader seems to speak only Polyglot, but secretly understands Common (something she puts to advantage by hearing the PCs talk amongst themselves). I also like that the negotiations here don't boil down to a single Diplomacy check, but are a real series of offers and requests, with multiple checks and modifiers involved (so much so that careful prep on the part of the GM would be important). During the journey, the Pathfinders often find themselves hearing strange howling at night and the sense of being stalked. Eventually, they're attacked twice by a supernatural manifestation of Stuinvolk's guilt in the form of a mngwa (a nightmarish jungle cat). The trick is that the mngwa can be defeated only if Stuinvolk delivers the "killing" blow, and he may or may not be in a condition to do this if the PCs have earned enough empathy points. It was an interesting and unusual situation to be in as a player (setting an NPC up for the kill), and I like encounters that deliver surprises. As the PCs get closer into the hills where the nuno gremlin resides, there's a completely filler encounter against hyenas. The nuno, named Bujune, presents another solid and interesting choice for the PCs. He can be killed (which will lift the curse) or he can be negotiated with. If the latter option is chosen, he offers the PCs a deal: he'll lift the curse on Stuinvolk if the Pathfinders investigate what's going on inside some giant anthills nearby where the ants have become sickly and deranged. The final portion of the scenario has the PCs navigating underground ant tunnels. A series of skill checks determine whether they find their way or get lost and face multiple encounters of giant undead ants. 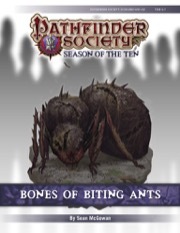 I think most groups will have the skills to avoid too many extra encounters, but if they have too much bad luck I imagine they could be worn down before the big finish: a battle against several more undead ants and their queen, "She Who Devours" (a deathweb). It turns out that the artifacts that Stuinvolk left behind had the effect of releasing necrotic energy which turned the normal inhabitants of the area into soulless abominations! It was a good, reasonably tough and satisfying climax. Two miscellaneous points: 1) the scenario does a really good job incorporating rules and options from Occult Adventures for characters with psychic abilities, something I don't see very often; 2) the scenario didn't do much with the Mwangi environment--the heat dangers were nerfed substantially, and there weren't any other of the classic hazards presented (insects, disease, etc.). Overall, although I had some qualms at the time, I can see that Bones of Biting Ants is a really good scenario. It has an interesting goal that asks the PCs to be more than just killing machines, and to actually help an individual on a personal, emotional level. I'm impressed by that, and I would like to continue to see more scenarios that stretch the boundaries of what PFS scenarios can involve. Very nice but time consuming prep work on this one. What really got me, was: I have PTSD and Anxiety and role playing Stuinvolk followed the rabbit down the dark hole. Just reading it had me overly empathizing and shaking as I tried to consider how to bring this to my players. I chose to have a friend role play Stuinvolk, and truly bring the character to life, which helped the party feel like he wasn't just an annoying aspect of the GM, and helped them to empathize with him. It is worth playing, but please be aware that this can be an emotional roller coaster. I wrote a giant review and the website ate it. Bottom line: the story is compelling, filled with the original goals of the Shadow Lodge and empathy, along with the understanding that not all wounds are physical. The mid-scenario encounter is just as deadly as everyone else says, as it's a unique critter (at least, in high subtier) that is effectively a Dire Tiger with upgrades, but no CR adjustment. Good use of Occult mechanics, good RP opportunities interspersed, and, most importantly, a compelling objective for the Good-aligned PCs. If combat should breat out and the PCs didnt advance, which is reasonable, the Warriors have a hard time dealing with Archers and Medium-/Long-Range Casters since they can't delay those PCs. Other than that, it's a fun encounter. Army Ant Swarms are one the tougher swarms to deal with, having two advanced AAS and a Caster, who can controll half of the party with a high DC controll Spell in Round 2 and possibly hiding underground with burrow-speed is too much risk for a TPK. Our Blaster Sorcer (10d6+10 Fireball DC20) lost initiative against one of the swarms which resulted in a big chaos. The group survived this one with sheer luck. I am sorry for my writing, my English is not the best. Sounds a lot like Torch to me. Nieford Sharrowsmith is dead. His body is found in #6-16. My VO and I speculate that this might have something to do with a completely different scenario. #7-98: Serpents' Ire. There seems to be something in the title and location parallel to Rataji's story arc. Just learned I'll be running this at GenCon. Maps/Map Packs used? Ah-ha! Very interesting. Anxious to play this one. We're finalizing some pieces in the development process today and early next week. We should have a map update soon. I don't know about tie ins to other scenarios, but the name seems like a pretty direct tie in to The King of Biting Ants the mythic enemy of Old Man Jatembe. If so I have to play this with my Magaambyan Wizard. Found what you were talking about in Rataji's vision. Totally all ties in with The King of Biting Ants. Now I'm even more excited to play this! Is "Campsites" from the Gamemastery Map Pack series? Just looking so I can order it properly for GenCon. It should actually refer to Pathfinder Map-Pack: Camps and Shelters. Apologies for the confusion! I was kind of sad to find out it wasn't Lugizar Trantos from Mists of Mwangi. That would've made so much sense! Typo in description: "Mwangi Expanse" not "Mwangi expanse". We ran into an issue with this scenario today. In Area C1, obstacle 3 uses two trained-only skills as its required skills. None of my PCs has Handle Aninal or Sleight of Hand, so I ruled that they couldn’t complete the obstacle and therefore hand to take the failure penalty of fighting two ants. Handle Animal can be used to influence creatures untrained, it's training creatures that cannot be done untrained.